The Bluegreen Club 36 can be found just a few blocks off the famous Las Vegas Strip near the MGM Grand, New York New York, Mandalay Bay, the Luxor, and the Excalibur. 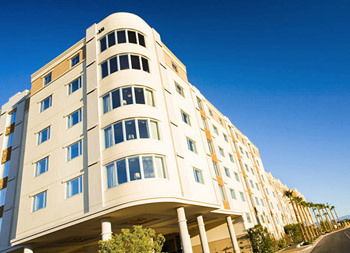 This is a convenient location, as it puts guests within easy reach of everything that the Strip has to offer. Even closer to the property is a retail center that features restaurants, video gambling, a liquor store, and more. Also worth noting in relation to the Bluegreen Club 36 location is the fact that the hotel is situated at latitude 36 degrees north. This explains the name of the vacation club. Inspired by the age of Parisian Art Deco, the Bluegreen Club 36 in Las Vegas is tastefully designed and offers attractive guest units that are referred to as villas. These villas are more akin to apartments than they are to your average hotel rooms. Guests can choose to book either a one or two-bedroom unit that is equipped with such delights as a full kitchen, a flat screen TV with cable, a DVD player, a CD stereo, and a washer and dryer. Also available is a Presidential Suite that offers extra space, added elegance, a theater, and a game room. Pets are not allowed, and smoking is prohibited within all of the guest units. The Bluegreen Club 36 Las Vegas features various facilities that guests can take advantage of when they aren’t relaxing in their well-equipped villas or soaking up all the action on the Strip. Among these facilities are a heated indoor pool, a hot tub, a fitness room, and a game room. Other features of this inviting property include concierge service, daily shuttle service to the Strip, and on-site security. Add it all up, and it becomes clear that the Bluegreen Club 36 can make for an excellent Las Vegas travel base.